Letter case is generally applied in a mixed-case fashion, with both upper- and lower-case letters appearing in a given piece of text. The choice of case is often prescribed by the grammar of a language or by the conventions of a particular discipline. In orthography, the upper case is primarily reserved for special purposes, such as the first letter of a sentence or of a proper noun, which makes the lower case the more common variant in regular text. In some contexts, it is conventional to use one case only. For example, engineering design drawings are typically labelled entirely in upper-case letters, which are easier to distinguish than the lower case, especially when space restrictions require that the lettering be small. In mathematics, on the other hand, letter case may indicate the relationship between objects, with upper-case letters often representing "superior" objects (e.g. X could be a set containing the generic member x). The terms upper case and lower case can be written as two consecutive words, connected with a hyphen (upper-case and lower-case – particularly if they pre-modify another noun), or as a single word (uppercase and lowercase). These terms originated from the common layouts of the shallow drawers called type cases used to hold the movable type for letterpress printing. Traditionally, the capital letters were stored in a separate shallow tray or "case" that was located above the case that held the small letters. Majuscule (/məˈdʒʌskjuːl/ or /ˈmædʒəskjuːl/), for palaeographers, is technically any script in which the letters have very few or very short ascenders and descenders, or none at all (for example, the majuscule scripts used in the Codex Vaticanus Graecus 1209, or the Book of Kells). By virtue of their visual impact, this made the term majuscule an apt descriptor for what much later came to be more commonly referred to as uppercase letters. Minuscule refers to lower-case letters. The word is often spelled miniscule, by association with the unrelated word miniature and the prefix mini-. This has traditionally been regarded as a spelling mistake (since minuscule is derived from the word minus), but is now so common that some dictionaries tend to accept it as a nonstandard or variant spelling. Miniscule is still less likely, however, to be used in reference to lower-case letters. Typographically, the basic difference between the majuscules and minuscules is not that the majuscules are big and minuscules small, but that the majuscules generally have the same height (although, depending on the typeface, there may be some exceptions, particularly with Q and sometimes J having a descending element; also, various diacritics can add to the normal height of a letter). 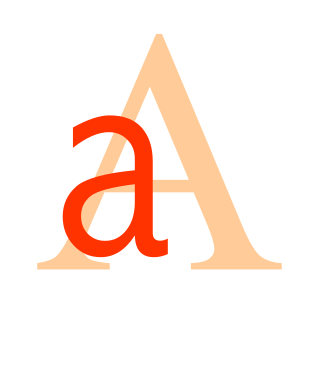 Ascenders (as in "h") and descenders (as in "p") make the height of lower-case letters vary. There is more variation in the height of the minuscules, as some of them have parts higher (ascenders) or lower (descenders) than the typical size. Normally, b, d, f, h, k, l, t [a] are the letters with ascenders, and g, j, p, q, y are the ones with descenders. In addition, with old-style numerals still used by some traditional or classical fonts, 6 and 8 make up the ascender set, and 3, 4, 5, 7 and 9 the descender set. Writing systems using two separate cases are bicameral scripts. Languages that use the Latin, Cyrillic, Greek, Coptic, Armenian, Adlam, Warang Citi, Cherokee, and Osage scripts use letter cases in their written form as an aid to clarity. Other bicameral scripts, which are not used for any modern languages, are Old Hungarian, Glagolitic, and Deseret. The Georgian alphabet has several variants, and there were attempts to use them as different cases, but the modern written Georgian language does not distinguish case. Many other writing systems make no distinction between majuscules and minuscules – a system called unicameral script or unicase. This includes most syllabic and other non-alphabetic scripts. In scripts with a case distinction, lower case is generally used for the majority of text; capitals are used for capitalisation and emphasis. Acronyms (and particularly initialisms) are often written in all-caps, depending on various factors. Capitalisation is the writing of a word with its first letter in uppercase and the remaining letters in lowercase. Capitalisation rules vary by language and are often quite complex, but in most modern languages that have capitalisation, the first word of every sentence is capitalised, as are all proper nouns. Capitalisation in English, in terms of the general orthographic rules independent of context (e.g. title vs. heading vs. text), is universally standardised for formal writing. Capital letters are used as the first letter of a sentence, a proper noun, or a proper adjective. The names of the days of the week and the names of the months are also capitalised, as are the first-person pronoun "I" and the interjection "O" (although the latter is uncommon in modern usage, with "oh" being preferred). There are a few pairs of words of different meanings whose only difference is capitalisation of the first letter. Honorifics and personal titles showing rank or prestige are capitalised when used together with the name of the person (for example, "Mr. Smith", "Bishop O'Brien", "Professor Moore") or as a direct address, but normally not when used alone and in a more general sense. It can also be seen as customary to capitalise any word – in some contexts even a pronoun – referring to the deity of a monotheistic religion. Other words normally start with a lower-case letter. There are, however, situations where further capitalisation may be used to give added emphasis, for example in headings and publication titles (see below). In some traditional forms of poetry, capitalisation has conventionally been used as a marker to indicate the beginning of a line of verse independent of any grammatical feature. Other languages vary in their use of capitals. For example, in German all nouns are capitalised (this was previously common in English as well, mainly in the 17th and 18th centuries), while in Romance and most other European languages the names of the days of the week, the names of the months, and adjectives of nationality, religion and so on normally begin with a lower-case letter. On the other hand, in some languages it is customary to capitalise formal polite pronouns, for example De, Dem (Danish), Sie, Ihnen (German), and Vd or Ud (short for usted in Spanish). Informal communication, such as texting, instant messaging or a handwritten sticky note, may not bother to follow the conventions concerning capitalisation, but that is because its users usually do not expect it to be formal. The German letter "ß" only used to exist in lower case. The orthographical capitalisation does not concern "ß", which never occurs at the beginning of a word, and in the all-caps style it has traditionally been replaced by the digraph "SS". Since June 2017, however, capital ẞ is accepted as an alternative in the all-caps style. The Greek upper-case letter "Σ" has two different lower-case forms: "ς" in word-final position and "σ" elsewhere. In a similar manner, the Latin upper-case letter "S" used to have two different lower-case forms: "s" in word-final position and " ſ " elsewhere. The latter form, called the long s, fell out of general use before the middle of the 19th century, except for the countries that continued to use Blackletter typefaces such as Fraktur. When Blackletter type fell out of general use in the mid-20th century, even those countries dropped the long s.
Unlike most Latin-script languages, which link the dotless upper-case "I" with the dotted lower-case "i", Turkish has both a dotted and dotless I, each in both upper and lower case. Each of the two pairs ("İ/i" and "I/ı") represents a distinctive phoneme. In some languages, specific digraphs may be regarded as single letters, and in Dutch, the digraph "IJ/ij" is even capitalised with both components written in uppercase (for example, "IJsland" rather than "Ijsland"). In other languages, such as Welsh and Hungarian, various digraphs are regarded as single letters for collation purposes, but the second component of the digraph will still be written in lower case even if the first component is capitalised. Similarly, in South Slavic languages whose orthography is coordinated between the Cyrillic and Latin scripts, the Latin digraphs "ǈ/ǉ", "ǋ/ǌ" and "ǅ/ǆ" are each regarded as a single letter (like their Cyrillic equivalents "Љ/љ", "Њ/њ" and "Џ/џ", respectively), but only in all-caps style should both components be in upper case (e.g. ǈiǉan–ǇIǇAN, ǋoǌa–ǊOǊA, ǅiǆa–ǄIǄA). Unicode designates a single character for each case variant (i.e., upper case, title case and lower case) of the three digraphs. In the Hawaiian orthography, the ʻokina is a phonemic symbol that visually resembles a left single quotation mark. Representing the glottal stop, the ʻokina can either be characterized as a letter or a diacritic. As a unicase letter, the ʻokina is unaffected by capitalisation; it is the following letter that is capitalised instead. According to the Unicode standard, the ʻokina is formally encoded as U+02BB ʻ MODIFIER LETTER TURNED COMMA, but it is not uncommon to substitute this with a similar punctuation character, such as the left single quotation mark or an apostrophe. Font effects such as italic type or oblique type, boldface, and choice of serif vs. sans-serif. Typographical conventions in mathematical formulae include the use of Greek letters and the use of Latin letters with special formatting such as blackboard bold and blackletter. Letters of the Arabic and Hebrew alphabets (some final forms only), and some jamo of the Korean hangul have different forms for initial or final placement, but these rules are strict and the different forms cannot be used for emphasis. In Georgian, some authors use isolated letters from the ancient Asomtavruli alphabet within a text otherwise written in the modern Mkhedruli in a fashion that is reminiscent of the usage of upper-case letters in the Latin, Greek, and Cyrillic alphabets. In the Japanese writing system, an author has the option of switching between kanji, hiragana, katakana, and rōmaji. In particular, every hiragana character has an equivalent katakana character, and vice versa. Romanised Japanese sometimes uses lowercase letters to represent words that would be written in hiragana, and uppercase letters to represent words that would be written in katakana. Some kana characters are written in smaller type when they modify or combine with the preceding sign (yōon) or the following sign (sokuon). A mixed-case style in which the first word of the sentence is capitalised, as well as proper nouns and other words as required by a more specific rule. This is generally equivalent to the baseline universal standard of formal English orthography. A mixed-case style with all words capitalised, except for certain subsets (particularly articles and short prepositions and conjunctions) defined by rules that are not universally standardised. The standardisation is only at the level of house styles and individual style manuals. (See further explanation below at § Headings and publication titles.) In text processing, title case usually involves the capitalisation of all words irrespective of their part of speech. This simplified variant of title case is also known as start case or initial caps. A unicase style with capital letters only. This can be used in headings and special situations, such as for typographical emphasis in text made on a typewriter. With the advent of the Internet, the all-caps style is more often used for emphasis; however, it is considered poor netiquette by some to type in all capitals, and said to be tantamount to shouting. Long spans of Latin-alphabet text in all upper-case are harder to read because of the absence of the ascenders and descenders found in lower-case letters, which can aid recognition. In some cultures it is common to write family names in all caps to distinguish them from the given names, especially in identity documents such as passports. Similar in form to capital letters but roughly the size of a lower-case "x", small caps can be used instead of lower-case letters and combined with regular caps in a mixed-case fashion. This is a feature of certain fonts such as Copperplate Gothic. According to various typographical traditions, the height of small caps can be equal to or slightly larger than the x-height of the typeface (the smaller variant is sometimes called petite caps and may also be mixed with the larger variant). Small caps can be used for acronyms, names, mathematical entities, computer commands in printed text, business or personal printed stationery letterheads, and other situations where a given phrase needs to be distinguished from the main text. A unicase style with no capital letters. This is sometimes used for artistic effect, such as in poetry. Also commonly seen in computer languages, and in informal electronic communications such as SMS language and instant messaging (avoiding the shift key, to type more quickly). In English-language publications, various conventions are used for the capitalisation of words in publication titles and headlines, including chapter and section headings. The rules differ substantially between individual house styles. The convention followed by many British publishers (including scientific publishers, like Nature, magazines, like The Economist and New Scientist, and newspapers, like The Guardian and The Times) and also U.S. newspapers, is sentence-style capitalisation in headlines, i.e. capitalisation follows the same rules that apply for sentences. This convention is usually called sentence case. It may also be applied to publication titles, especially in bibliographic references and library catalogues. An example of a global publisher whose English-language house style prescribes sentence-case titles and headings is the International Organization for Standardization. Most styles capitalise all words except for short closed-class words (certain parts of speech, namely, articles, prepositions, and conjunctions); but the first word (always) and last word (in many styles) are also capitalised, regardless of their part of speech. Many styles capitalise longer prepositions such as "between" and "throughout", but not shorter ones such as "for" and "with". Typically, a preposition is considered short if it has up to three or four letters. A few styles capitalise all words in title case (the so-called start case), which has the advantage of being easy to implement and hard to get "wrong" (that is, "not edited to style"). Because of this rule's simplicity, software case-folding routines can handle 95% or more of the editing, especially if they are programmed for desired exceptions (such as "FBI" rather than "Fbi"). As for whether hyphenated words are capitalised not only at the beginning but also after the hyphen, there is no universal standard; variation occurs in the wild and among house styles (e.g., "The Letter-Case Rule in My Book"; "Short-term Follow-up Care for Burns"). Traditional copyediting makes a distinction between temporary compounds (such as many nonce [novel instance] compound modifiers), in which every part of the hyphenated word is capitalised (e.g. "How This Particular Author Chose to Style His Autumn-Apple-Picking Heading"), and permanent compounds, which are terms that, although compound and hyphenated, are so well established that dictionaries enter them as headwords (e.g., "Short-term Follow-up Care for Burns"). Title case is widely used in many English-language publications, especially in the United States. However, its conventions are sometimes not followed strictly – especially in informal writing. In creative typography, such as music record covers and other artistic material, all styles are commonly encountered, including all-lowercase letters and special case styles, such as studly caps (see below). For example, in the wordmarks of video games it is not uncommon to use stylised upper-case letters at the beginning and end of a title, with the intermediate letters in small caps or lower case (e.g., ArcaniA, ArmA, and DmC). Single-word proper nouns are capitalised in formal written English, unless the name is intentionally stylised to break this rule (such as the first or last name of danah boyd). Multi-word proper nouns include names of organisations, publications, and people. Often the rules for "title case" (described in the previous section) are applied to these names, so that non-initial articles, conjunctions, and short prepositions are lowercase, and all other words are uppercase. For example, the short preposition "of" and the article "the" are lowercase in "Steering Committee of the Finance Department". Usually only capitalised words are used to form an acronym variant of the name, though there is some variation in this. With personal names, this practice can vary (sometimes all words are capitalised, regardless of length or function), but is not limited to English names. Examples include the English names Tamar of Georgia and Catherine the Great, "van" and "der" in Dutch names, "von" and "zu" in German, "de", "los", and "y" in Spanish names, "de" or "d'" in French names, and "ibn" in Arabic names. Some surname prefixes also affect the capitalisation of the following internal letter or word, for example "Mac" in Celtic names and "Al" in Arabic names. Spaces and punctuation are removed and the first letter of each word is capitalised. If this includes the first letter of the first word ("CamelCase", "PowerPoint", "TheQuick...", etc. ), the case is sometimes called upper camel case (or, illustratively, CamelCase), Pascal case, or bumpy case. When the first letter of the first word is lowercase ("iPod", "eBay", "theQuickBrownFox..."), the case is usually known as lower camel case (illustratively: camelCase). This format has become popular in the branding of information technology products and services. Punctuation is removed and spaces are replaced by single underscores. Normally the letters share the same case (e.g. "UPPER_CASE_EMBEDDED_UNDERSCORE" or "lower_case_embedded_underscore") but the case can be mixed, as in OCaml modules.. The style may also be called pothole case, especially in Python programming, in which this convention is often used for naming variables. Illustratively, it may be rendered snake_case, pothole_case, etc. When all-upper-case, it may be referred to as screaming snake case (or SCREAMING_SNAKE_CASE). Similar to snake case, above, except hyphens rather than underscores are used to replace spaces. It is also known as spinal case, param case, Lisp case, and dash case (or illustratively as kebab-case) If every word is capitalised, the style is known as train case (TRAIN-CASE). Perl6 supports kebab case style. Mixed case with no semantic or syntactic significance to the use of the capitals. Sometimes only vowels are upper case, at other times upper and lower case are alternated, but often it is simply random. The name comes from the sarcastic or ironic implication that it was used in an attempt by the writer to convey their own coolness. It is also used to mock the violation of standard English case conventions by marketers in the naming of computer software packages, even when there is no technical requirement to do so – e.g., Sun Microsystems' naming of a windowing system NeWS. Illustrative naming of the style is, naturally, random: stUdlY cAps, StUdLy CaPs, etc. 1 s (one second) when used for the base unit of time. 1 S (one siemens) when used for the unit of electric conductance and admittance (named after Werner von Siemens). 1 Sv (one sievert), used for the unit of ionising radiation dose (named after Rolf Maximilian Sievert). 1 l, the original form, for typefaces in which "digit one" ⟨1⟩, "lower-case ell" ⟨l⟩, and "upper-case eye" ⟨I⟩ look different. 1 L, an alternative form, for typefaces in which these characters are difficult to distinguish, or the typeface the reader will be using is unknown. A "script l" in various typefaces (e.g. : 1 l) has traditionally been used in some countries to prevent confusion; however, the separate Unicode character which represents this, U+2113 ℓ SCRIPT SMALL L, is deprecated by the SI. Another solution sometimes seen in Web typography is to use a serif font for "lower-case ell" in otherwise sans-serif material (1 l). 1 ms, a small measure of time ("m" for milli, meaning 10−3 = 1/1000 multiplier). 1 Ms, a large measure of time ("M" for mega, meaning 106 = 1 000 000 multiplier). 1 mS, a small measure of electric conductance. 1 MS, a large measure of electric conductance. 1 mm, a small measure of length (the latter "m" for metre). 1 Mm, a large measure of length. Case-insensitive operations can be said to fold case, from the idea of folding the character code table so that upper- and lower-case letters coincide. The conversion of letter case in a string is common practice in computer applications, for instance to make case-insensitive comparisons. Many high-level programming languages provide simple methods for case conversion, at least for the ASCII character set. Whether or not the case variants are treated as equivalent to each other varies depending on the computer system and context. For example, user passwords are generally case sensitive in order to allow more diversity and make them more difficult to break. On the other hand, when performing a keyword search, differentiating between the upper and lower case might narrow down the search result too much. Unicode defines case folding through the three case-mapping properties of each character: upper case, lower case, and title case (in this context, "title case" relates to ligatures and digraphs encoded as mixed-case single characters, in which the first component is in upper case and the second component in lower case). These properties relate all characters in scripts with differing cases to the other case variants of the character. As briefly discussed in Unicode Technical Note #26, "In terms of implementation issues, any attempt at a unification of Latin, Greek, and Cyrillic would wreak havoc [and] make casing operations an unholy mess, in effect making all casing operations context sensitive […]". In other words, while the shapes of letters like A, B, E, H, K, M, O, P, T, X, Y and so on are shared between the Latin, Greek, and Cyrillic alphabets (and small differences in their canonical forms may be considered to be of a merely typographical nature), it would still be problematic for a multilingual character set or a font to provide only a single code point for, say, uppercase letter B, as this would make it quite difficult for a wordprocessor to change that single uppercase letter to one of the three different choices for the lower-case letter, the Latin b (U+0062), Greek β (U+03B2) or Cyrillic в (U+0432). Therefore, the corresponding Latin, Greek and Cyrillic upper-case letters (U+0042, U+0392 and U+0412, respectively) are also encoded as separate characters, despite their appearance being basically identical. Without letter case, a "unified European alphabet" – such as ABБCГDΔΕЄЗFΦGHIИJ…Z, with an appropriate subset for each language – is feasible; but considering letter case, it becomes very clear that these alphabets are rather distinct sets of symbols. Most modern word processors provide automated case conversion with a simple click or keystroke. For example, in Microsoft Office Word, there is a dialog box for toggling the selected text through UPPERCASE, then lowercase, then Title Case (actually start caps; exception words must be lowercased individually). The keystroke ⇧ Shift+F3 does the same thing. This only works because the letters of upper and lower cases are spaced out equally. In ASCII they are consecutive, whereas with EBCDIC they are not; nonetheless the upper-case letters are arranged in the same pattern and with the same gaps as are the lower-case letters, so the technique still works. Some computer programming languages offer facilities for converting text to a form in which all words are capitalised. Visual Basic calls this "proper case"; Python calls it "title case". This differs from usual title casing conventions, such as the English convention in which minor words are not capitalised. Demonstrating the use of a composing stick in front of divided upper and lower type cases at the International Printing Museum in Carson, California, United States, North America. Originally alphabets were written entirely in majuscule letters, spaced between well-defined upper and lower bounds. When written quickly with a pen, these tended to turn into rounder and much simpler forms. It is from these that the first minuscule hands developed, the half-uncials and cursive minuscule, which no longer stayed bound between a pair of lines. These in turn formed the foundations for the Carolingian minuscule script, developed by Alcuin for use in the court of Charlemagne, which quickly spread across Europe. The advantage of the minuscule over majuscule was improved, faster readability. In Latin, papyri from Herculaneum dating before 79 CE (when it was destroyed) have been found that have been written in old Roman cursive, where the early forms of minuscule letters "d", "h" and "r", for example, can already be recognised. According to papyrologist Knut Kleve, "The theory, then, that the lower-case letters have been developed from the fifth century uncials and the ninth century Carolingian minuscules seems to be wrong." Both majuscule and minuscule letters existed, but the difference between the two variants was initially stylistic rather than orthographic and the writing system was still basically unicameral: a given handwritten document could use either one style or the other but these were not mixed. European languages, except for Ancient Greek and Latin, did not make the case distinction before about 1300. Gothic majuscule (13th and 14th century), in contrast to the early Gothic (end of 11th to 13th century), Gothic (14th century), and late Gothic (16th century) minuscules. Traditionally, certain letters were rendered differently according to a set of rules. In particular, those letters that began sentences or nouns were made larger and often written in a distinct script. There was no fixed capitalisation system until the early 18th century. The English language eventually dropped the rule for nouns, while the German language keeps it. Similar developments have taken place in other alphabets. The lower-case script for the Greek alphabet has its origins in the 7th century and acquired its quadrilinear form in the 8th century. Over time, uncial letter forms were increasingly mixed into the script. The earliest dated Greek lower-case text is the Uspenski Gospels (MS 461) in the year 835. The modern practice of capitalising the first letter of every sentence seems to be imported (and is rarely used when printing Ancient Greek materials even today). Simplified relationship between various scripts leading to the development of modern lower case of standard Latin alphabet and that of the modern variants Fraktur (used in Germany until 1940s) and Gaelic (used in Ireland). Several scripts coexisted such as half-uncial and uncial, which derive from Roman cursive and Greek uncial, and Visigothic, Merovingian (Luxeuil variant here) and Beneventan. The Carolingian script was the basis for blackletter and humanist minuscule. What is commonly called "Gothic writing" is technically called blackletter (here textualis quadrata) and is completely unrelated to Visigothic script. The letter j is i with a flourish, u and v are the same letter in early scripts and were used depending on their position in insular half-uncial and caroline minuscule and later scripts, w is a ligature of vv, in insular the rune wynn is used as a w (three other runes in use were the thorn (þ), ʻféʼ (ᚠ) as an abbreviation for cattle/goods and maðr (ᛘ) for man). The letters y and z were very rarely used, in particular þ was written identically to y so y was dotted to avoid confusion, the dot was adopted for i only after late-caroline (protogothic), in beneventan script the macron abbreviation featured a dot above. Lost variants such as r rotunda, ligatures and scribal abbreviation marks are omitted; long s is shown when no terminal s (the only variant used today) is preserved from a given script. Humanist script was the basis for Venetian types which changed little until today, such as Times New Roman (a serifed typeface). The individual type blocks used in hand typesetting are stored in shallow wooden or metal drawers known as "type cases". Each is subdivided into a number of compartments ("boxes") for the storage of different individual letters. The Oxford Universal Dictionary on Historical Advanced Proportional Principles (reprinted 1952) indicates that case in this sense (referring to the box or frame used by a compositor in the printing trade) was first used in English in 1588. Originally one large case was used for each typeface, then "divided cases", pairs of cases for majuscules and minuscules, were introduced in the region of today's Belgium by 1563, England by 1588, and France before 1723. The terms upper and lower case originate from this division. By convention, when the two cases were taken out of the storage rack, and placed on a rack on the compositor's desk, the case containing the capitals and small capitals stood at a steeper angle at the back of the desk, with the case for the small letters, punctuation and spaces being more easily reached at a shallower angle below it to the front of the desk, hence upper and lower case. Though pairs of cases were used in English-speaking countries and many European countries in the seventeenth century, in Germany and Scandinavia the single case continued in use. Various patterns of cases are available, often with the compartments for lower-case letters varying in size according to the frequency of use of letters, so that the commonest letters are grouped together in larger boxes at the centre of the case. The compositor takes the letter blocks from the compartments and places them in a composing stick, working from left to right and placing the letters upside down with the nick to the top, then sets the assembled type in a galley. ^ In Roman Antiqua or other vertical fonts, the defunct Initial or Medial Long-s, ſ, would have been an ascender; however, in italics, it would have been one of only two letters in the English or Expanded Latin Alphabet with both an ascender and a descender, the other being f.
Alexander Nesbitt (1957). The History and Technique of Lettering (1st ed.). New York City: Dover Publications. ISBN 0-486-20427-8. ^ "The School's Manual of Style". Johns Hopkins, Bloomberg School of Public Health. Retrieved 9 November 2018. ^ Hansard, Thomas Curson (1825). Typographia, an Historical Sketch of the Origin and Progress of the Art of Printing. pp. 408, 4806. Retrieved 12 August 2015. ^ Marc Drogin (1980). Medieval Calligraphy: Its History and Technique. Courier Corporation. p. 37. ^ Charlton T. Lewis (1890). "Minusculus". An Elementary Latin Dictionary. New York, Cincinnati, and Chicago: American Book Company. ^ The American Heritage Dictionary of the English Language (4th ed.). Boston and New York: Houghton Mifflin. 2000. ISBN 978-0-395-82517-4. ^ a b Dennis Oliver. "Using Capital Letters (#1)". Dave's ESL Cafe. Retrieved 19 February 2017. ^ Nancy Edmonds Hanson (25 August 2008). "AP Style: Courtesy and Professional Titles". Minnesota State University. Retrieved 19 February 2017. ^ "Capitalizing Titles of People". English Plus. 1997–2006. Retrieved 19 February 2017. ^ "Capitalization". The Chicago Manual of Style Online. Retrieved 19 February 2017. ^ "Citing Sources: Capitalization and Personal Names in Foreign Languages". Waidner-Spahr Library. Dickinson. Retrieved 30 March 2017. ^ Cf. Güthert, Kerstin (2017), PRESSEMITTEILUNG 29.6.2017 Amtliches Regelwerk der deutschen Rechtschreibung aktualisiert (PDF), Council for German Orthography, p. 1, retrieved 2017-06-29 . ^ "Ijsland / IJsland". Taalunie. Retrieved 9 March 2014. ^ "Latin Extended-B" (PDF). Unicode. U+01C4, U+01C5, U+01C6, U+01C7, U+01C8, U+01C9, U+01CA, U+01CB, U+01CC. Retrieved 5 February 2017. ^ "Why I Spell it Hawai'i and not Hawaii, and Why You Should, Too". Blond Voyage. Retrieved 6 August 2017. ^ "Hawaiian Language Online". The University of Hawai‘i. Retrieved 6 August 2017. ^ "Spacing Modifier Letters" (PDF). Unicode. U+02BB. Retrieved 6 August 2017. ^ "'Ōlelo Hawai'i on the WWW: A.K.A., How To Give Good 'Okina". KeolaDonaghy.com. Retrieved 6 August 2017. ^ RFC 1855 "Netiquette Guidelines"
^ "Registered features – definitions and implementations". OpenType Layout tag registry. Microsoft. Tag:'pcap', Tag: 'smcp'. Retrieved 24 March 2017. ^ "The Guardian and Observer Style Guide". Retrieved 10 June 2014. ^ R. M. Ritter, ed. (2002). Oxford Manual of Style. Oxford University Press. ^ Currin Berdine. "What to Capitalize in a Title". AdminSecret. Retrieved 23 February 2014. ^ "History around Pascal Casing and Camel Casing". ^ "Caml programming guidelines". caml.inria.fr. Retrieved 2017-03-31. ^ "Ruby Style Guide". Retrieved 11 November 2013. ^ "jQuery 3.0 and jQuery Compat 3.0 Alpha Versions Released". ^ a b c Bureau International des Poids et Mesures (2006). "The International System of Units" (PDF). Organisation Intergouvernementale de la Convention du Mètre. pp. 121, 130–131. Retrieved 12 January 2014. ^ "Letterlike symbols". Charts (Beta). Unicode Consortium. Retrieved 28 July 2017. ^ "Character Properties, Case Mappings & Names FAQ". Unicode. Retrieved 19 February 2017. ^ "Unicode Technical Note #26: On the Encoding of Latin, Greek, Cyrillic, and Han". Retrieved 23 April 2007. ^ David Harris (2003). The Calligrapher's Bible. Hauppauge, NY: Barron's. ISBN 0-7641-5615-2. ^ Knut Kleve (1994). "The Latin Papyri in Herculaneum". Proceedings of the 20th International Congress of Papyrologists, Copenhagen, 23–29 August 1992. Copenhagen: Museum Tusculanum Press. ^ The earliest known biblical manuscript is a palimpsest of Isajah in Syriac, written in 459/460. Bruce M. Metzger & Bart D. Ehrman, The Text of the New Testament (Oxford University Press: 2005), p. 92. ^ a b c d David Bolton (1997). "Type Cases". The Alembic Press. Archived from the original on 16 July 2007. Retrieved 23 April 2007. Hamilton, Frederick W. (1918). Capitals: A Primer of Information About Capitalization with Some Practical Typographic Hints as to the Use of Capitals – via Project Gutenberg. Greer, Sarah; Sowden, Elizabeth; Scharff, Lauren (2003). "Effects of Email Format and Instructions on Reading Times, Content Retention, and Reader Preference". Stephen F. Austin State University. – One of this paper's conclusions: all-caps is harder to read. Online Text Case Converter: Convert to Title Case, Sentence Case, Uppercase & Lowercase. "Lower Case and the Unix Philosophy". LInfo.org. Linux Information Project. December 30, 2004. In typography, all caps (short for "all capitals") refers to text or a font in which all letters are capital letters, for example: Text in All Caps. "All caps" may be used for emphasis (for a word or phrase). They are commonly seen in the titles on book covers, in advertisements and in newspaper headlines. Short strings of words in capital letters appear bolder and "louder" than mixed case, and this is sometimes referred to as "screaming" or "shouting". All caps can also be used to indicate that a given word is an acronym. Studies have been conducted on the readability and legibility of all caps text. Scientific testing from the 20th century onwards has generally indicated that all caps text is less legible and readable than lower-case text. In addition, switching to all caps may make text appear hectoring and obnoxious for cultural reasons, since all-capitals is often used in transcribed speech to indicate that the speaker is shouting. All-caps text is common in comic books, as well as on older teleprinter and radio transmission systems, which often do not indicate letter case at all.In professional documents, a commonly preferred alternative to all caps text is the use of small caps to emphasise key names or acronyms (for example, Text in Small Caps), or the use of italics or (more rarely) bold. In addition, if all caps must be used it is customary to slightly widen the spacing between the letters, by around 10% of the point height. This practice is known as tracking or letterspacing. Some digital fonts contain alternative spacing metrics for this purpose. With the adoption of letters from the International Phonetic Alphabet (IPA) in various national alphabets, letter case forms have been developed. This usually means capital (uppercase) forms were developed, but in the case of the glottal stop ʔ, both uppercase ⟨Ɂ⟩ and lowercase ⟨ɂ⟩ are used. MBƱ AJƐYA KIGBƐNDƱƱ ŊGBƐYƐ KEDIƔZAƔ SƆSƆƆ TƆM SE.Some of the IPA letters that were adopted into language orthographies have since become obsolete in the IPA itself. Devanagari ( DAY-və-NAH-gər-ee; देवनागरी, IAST: Devanāgarī, Sanskrit pronunciation: [deːʋɐˈnaːɡɐɽiː]), also called Nagari (Nāgarī, नागरी), is a left-to-right abugida (alphasyllabary), based on the ancient Brāhmī script, used in the Indian subcontinent. It was developed in ancient India from the 1st to the 4th century CE, and was in regular use by the 7th century CE. The Devanagari script, composed of 47 primary characters including 14 vowels and 33 consonants, is one of the most adopted writing systems in the world, being used for over 120 languages. The ancient Nagari script for Sanskrit had two additional consonantal characters.The orthography of this script reflects the pronunciation of the language. Unlike the Latin alphabet, the script has no concept of letter case. It is written from left to right, has a strong preference for symmetrical rounded shapes within squared outlines, and is recognisable by a horizontal line that runs along the top of full letters. In a cursory look, the Devanagari script appears different from other Indic scripts such as Bengali, Odia, or Gurmukhi, but a closer examination reveals they are very similar except for angles and structural emphasis.Among the languages using it – as either their only script or one of their scripts – are Sanskrit, Hindi, Nepali, Pali, Prakrit, Apabhramsha, Awadhi, Bhojpuri, Braj Bhasha, Chhattisgarhi, Haryanvi, Magahi, Nagpuri, Rajasthani, Bhili, Dogri, Marathi, Maithili, Kashmiri, Konkani, Sindhi, Bodo, Nepalbhasa, Mundari and Santali. The Devanagari script is closely related to the Nandinagari script commonly found in numerous ancient manuscripts of South India, and it is distantly related to a number of southeast Asian scripts. A filename (also written as two words, file name) is a name used to uniquely identify a computer file stored in a file system. Different file systems impose different restrictions on filename lengths and the allowed characters within filenames. version – revision or generation number of the fileThe components required to identify a file varies across operating systems, as does the syntax and format for a valid filename. Discussions of filenames are complicated by a lack of standardization of the term. Sometimes "filename" is used to mean the entire name, such as the Windows name c:\directory\myfile.txt. Sometimes, it will be used to refer to the components, so the filename in this case would be myfile.txt. Sometimes, it is a reference that excludes an extension, so the filename would be just myfile. As a result of the increasing popularity and dominance of the Google search engine, usage of the transitive verb to google (also spelled Google) grew ubiquitously. The neologism commonly refers to searching for information on the World Wide Web, regardless of which search engine is used. The American Dialect Society chose it as the "most useful word of 2002." It was added to the Oxford English Dictionary on June 15, 2006, and to the eleventh edition of the Merriam-Webster Collegiate Dictionary in July 2006. The Greek alphabet has been used to write the Greek language since the late ninth or early eighth century BC. It is derived from the earlier Phoenician alphabet, and was the first alphabetic script to have distinct letters for vowels as well as consonants. In Archaic and early Classical times, the Greek alphabet existed in many different local variants, but, by the end of the fourth century BC, the Eucleidean alphabet, with twenty-four letters, ordered from alpha to omega, had become standard and it is this version that is still used to write Greek today. These twenty-four letters are: Α α, Β β, Γ γ, Δ δ, Ε ε, Ζ ζ, Η η, Θ θ, Ι ι, Κ κ, Λ λ, Μ μ, Ν ν, Ξ ξ, Ο ο, Π π, Ρ ρ, Σ σ/ς, Τ τ, Υ υ, Φ φ, Χ χ, Ψ ψ, and Ω ω. The Greek alphabet is the ancestor of the Latin and Cyrillic scripts. Like Latin and Cyrillic, Greek originally had only a single form of each letter; it developed the letter case distinction between uppercase and lowercase forms in parallel with Latin during the modern era. Sound values and conventional transcriptions for some of the letters differ between Ancient and Modern Greek usage, because the pronunciation of Greek has changed significantly between the fifth century BC and today. Modern and Ancient Greek also use different diacritics. Apart from its use in writing the Greek language, in both its ancient and its modern forms, the Greek alphabet today also serves as a source of technical symbols and labels in many domains of mathematics, science and other fields. The minuscule script was a Greek writing style which was developed as a book hand in Byzantine manuscripts during the 9th and 10th centuries. It replaced the earlier style of uncial writing, from which it differed in using smaller, more rounded and more connected letter forms, and in using a large number of ligatures. Many of these forms had previously developed as parts of more informal cursive writing. The basic letter shapes used in the minuscule script are the ancestors of modern lower case Greek letters. From the 10th century onwards, most Byzantine manuscripts of classical and early Christian Greek works were gradually rewritten in the new minuscule style, and few of the older uncial manuscripts were preserved. For this reason, uncial manuscripts are today extremely rare, while early minuscule manuscripts are often the oldest preserved sources attesting an ancient work and may therefore be of central importance for its philological study. Manuscripts from the oldest phase of minuscule writing (mid-9th to mid-10th century) are known in scholarship today as codices vetustissimi ("oldest codices"). Those from the mid-10th to the mid-12th centuries are known as codices vetusti ("old codices"), and later ones as codices recentiores ("newer codices").Minuscule writing remained in use for handwriting throughout the Byzantine and into the post-Byzantine era. In the modern era, western printers used minuscule book hands as a model for developing early Greek print fonts. Like with Latin, it became common to mix minuscule writing with some uncial or capital letters, with the latter used for emphasis, in titles and initials. From this practice, the modern orthographic system of letter case for Greek arose. In modern Greek writing, the upper case letters are generally modeled on the letter shapes of ancient inscriptions, while the lower case letters are based on the tradition of minuscule handwriting. The hyphen-minus (-) is a character used in digital documents and computing to represent a hyphen (‐) or a minus sign (−).It is present in Unicode as code point U+002D - HYPHEN-MINUS; it is also in ASCII with the same value. ISO-IR-111 or KOI8-E (formerly also ECMA-113 (1st ed., 1986)) is an 8-bit character set. It is a multinational extension of KOI-8 for Belarusian, Macedonian, Serbian, and Ukrainian (except Ґґ which is added to KOI8-F). In computer programming, a naming convention is a set of rules for choosing the character sequence to be used for identifiers which denote variables, types, functions, and other entities in source code and documentation. To enable code reviews to focus on more important issues than arguing over syntax and naming standards. To enable code quality review tools to focus their reporting mainly on significant issues other than syntax and style preferences.The choice of naming conventions can be an enormously controversial issue, with partisans of each holding theirs to be the best and others to be inferior. Colloquially, this is said to be a matter of dogma. Many companies have also established their own set of conventions. Open Letter is the third studio album R&B singer Case. It features the Tim & Bob produced "Missing You", which was his only number one hit to date. The album was certified Gold by the Recording Industry Association of America (RIAA). This is Case's last album on Def Jam Recordings. "Missing You" earned Case a nomination for Best Male R&B Vocal Performance at the 44th Grammy Awards in 2002. There are several romanization schemes for the Malayalam script, including ITRANS and ISO 15919. Scriptio continua (Latin for "continuous script"), also known as scriptura continua or scripta continua, is a style of writing without spaces, or other marks between the words or sentences. The form also lacks punctuation, diacritics, or distinguished letter case. In the West, the oldest Greek and Latin inscriptions used word dividers to separate words in sentences; however, Classical Greek and late Classical Latin both employed scriptio continua as the norm. Seoul Broadcasting System (SBS) (Hangul: 에스비에스; RR: Eseubieseu) is a national South Korean television and radio network company. In March 2000, the company legally became known as SBS, changing its corporate name from Seoul Broadcasting System (서울방송). It has provided terrestrial digital TV service in the ATSC format since 2001, and T-DMB (Digital Multimedia Broadcasting) service since 2005. Its flagship terrestrial television station is Channel 6 for Digital and Cable. The tonne ( (listen); non-SI unit, symbol: t), commonly referred to as the metric ton in the United States and Canada, is a non-SI metric unit of mass equal to 1,000 kilograms or one megagram (symbol: Mg). It is equivalent to approximately 2,204.6 pounds, 1.102 short tons (US) or 0.984 long tons (UK). Although not part of the SI, the tonne is accepted for use with SI units and prefixes by the International Committee for Weights and Measures.The tonne is derived from the mass of one cubic metre of pure water; one thousand litres of pure water has an absolute mass of one tonne.